Love rainbows and pots of gold at the end of them? You'll love this play slot online. Want to find the pot of gold at the end of the rainbow? Be in with a chance of finding that treasure in Rainbow Riches Drops of Gold. Rainbow Riches Drops of Gold is a 5 reel, 50-200 payline slot with an Irish luck theme. You'll take a visit to the magical leprechaun village where you'll follow the leprechauns as they run around trying to find the end of the rainbow. Rainbow Riches Drops of Gold has a lovely rainbow-coloured design with lots of Irish treasures and delights. There are plenty of lucky features including a drops of gold bonus and big bet game where the reels will expand to 200 paylines so you can create many more exciting gold coin wins. Barcrest has been in the gaming industry since 1968. As they have so much experience in the industry, it's a no brainer that their games are fantastic. They started off making machines for arcades and pubs and soon became one of the UK's largest fruit machine suppliers. Sign up today for Easy casino promos! 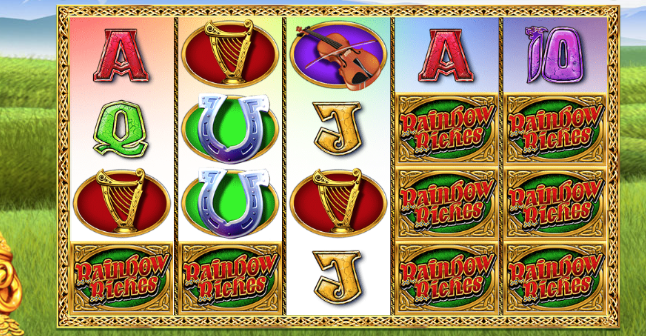 Rainbow Riches Drops of Gold is a 5 reel, 50-200 payline slot with an Irish luck theme. As you wander through the rainbow you'll see a trail of gold coins that leads to a giant pot of gold. The theme is on point all the way through with Irish-themed graphics and an upbeat Irish soundtrack. Behind the reels, you'll see a beautiful green meadow home to hundreds of little leprechauns as well as lots of trees and a clear blue sky. Above the main reel, you'll see an additional reel in the shape of a rainbow with lovely colours of red, orange, yellow, green, and blue. Symbols include harps, horseshoes, toadstools, violins, and silver and gold pots. The Wild Symbols - There are two wild symbols in Rainbow Riches Drops of Gold. These are the shiny silver and gold pots. The wilds substitute all other symbols on the reel bar the standard symbol to create winning combinations. Free Spins Feature - Land 3 or more rainbow bonus symbols to unlock the free spins feature. This will also trigger one of the bonus features. Here you will be awarded 8 free spins. Drops Of Gold Bonus - When the drops of gold bonus symbols land on the fifth reel, both the silver and gold pots will fall onto the main reel creating some rather exciting wins. Big Bet Game - If you want to be in with the chance of winning the top cash prizes, make sure to unlock the big bet function. The super rainbow will add an extra 100 paylines to the reel meaning there are 200 activated paylines. 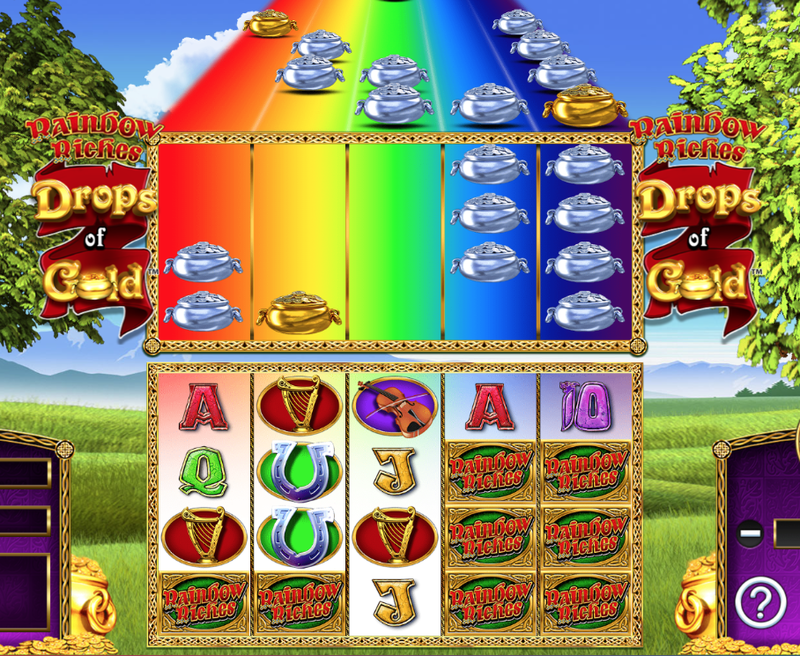 Experience the luck of the Irish with Rainbow Riches Drops of Gold. The design is truly magical with rainbow colours, leprechauns, and plenty of pots of gold. Activating the big bet game to add an extra 100 paylines is totally worth it if you're looking for a big golden win right here at Easy Slots.